1. Preheat oven to 350°F. Generously coat a large roasting pan and rack with cooking spray; set aside. 2. Remove giblets and neck from turkey; reserve for making gravy, if desired. Rinse turkey with cold water; pat dry. Place turkey, breast-side up, on rack in prepared pan. 3. In a small bowl, combine butter and one of the dry rub recipes. Using your fingers, carefully loosen skin from turkey at neck area, working down to breast and thigh area. Rub about half of the seasoned butter under the skin directly on the meat; rub remaining on outside of bird. Tie legs together with cooking twine or tuck under flap of skin. Lift wing tips up and over back; tuck under turkey. 4. 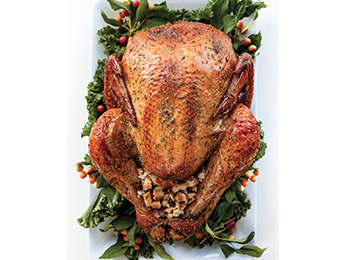 Lightly cover turkey with foil, leaving one side open, and roast for 2-2½ hours, basting occasionally with pan juices. During the last 30 minutes of cooking, remove foil so turkey browns to a golden color. Turkey is cooked when a meat thermometer inserted in the innermost part of the thigh and wing and the thickest part of the breast reaches a minimum of 165°F. Remove from oven, tent with foil and let sit for 10 minutes before carving.